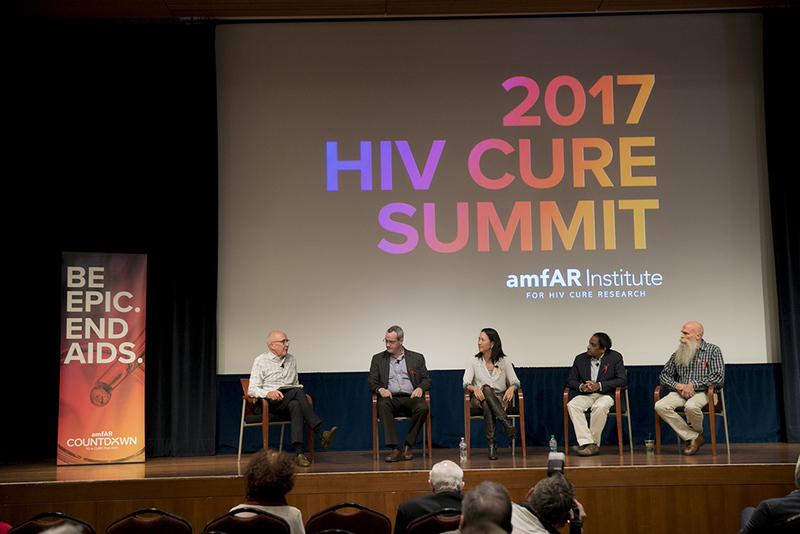 A wide range of perspectives—from clinicians, biomedical scientists and social researchers to patients and community leaders—were presented at amfAR’s 2017 World AIDS Day HIV Cure Summit at the University of California, San Francisco (UCSF), November 28. UCSF is home to the amfAR Institute for HIV Cure Research, established in 2015 with a five-year $20 million grant to UCSF. The community was well represented at the summit, with panelists including longtime treatment activists and amfAR Institute community advisory board co-chairs, Lynda Dee and Jeff Taylor, and the Institute’s other community advisory board members Loren Jones and Rob Newells. In addition, Clark Hawley and Luis Canales shared their personal experiences of participating in HIV cure research. Each has undergone a wide range of sometimes highly invasive procedures including countless blood draws and biopsies to contribute invaluable samples for HIV cure researchers. The summit was organized around a series of three panel discussions. 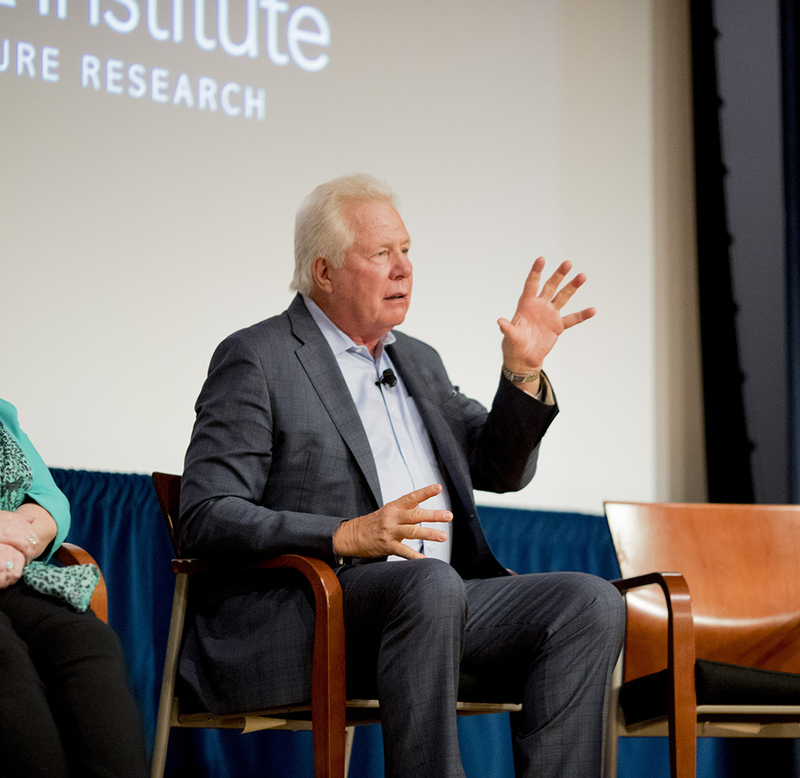 The first two, moderated by Dr. Paul Volberding, director of the AIDS Research Institute at UCSF and the amfAR Institute, focused on some of the potentially curative agents and strategies that are currently being developed and tested. Dr. Johnston outlined the three potential outcomes of cure-focused research. The first, post-treatment control, happens to a small number of people who go on therapy after a couple of months, stay on treatment for a period of years, and are then able to maintain control of the virus when they stop taking drugs. Third is the ideal scenario: a cure in which all virus is completely removed from the body. Timothy Brown, the “Berlin patient” is proof that this is possible, but the complex manner in which his cure was achieved makes it impossible to replicate on a broad scale. Dr. Warner Greene of UCSF and the Gladstone Institute of Virology and Immunology, who works as a biomedical researcher and member of the Institute’s board, summarized recent progress on what is known as the “shock and kill” strategy, in which reservoir cells are forced to produce virus that can then be attacked by the immune system or some other killing agent. After some early setbacks, “Now we’re looking at new generations of latency reversing agents that I think are more effective and less toxic,” said Dr. Greene. Institute researchers are beginning to move forward with a number of clinical studies of potentially curative interventions. One of them will be a complex, four-part combination vaccine study that will combine a therapeutic vaccine with broadly neutralizing antibodies. Participants will then undergo an ART treatment interruption to assess the combination’s effectiveness. In the second panel Drs. Satish Pillai, a biomedical researcher, and Peter Hunt, a clinician, both of whom are amfAR Institute board members, were joined by Dr. Nadia Roan, another biomedical researcher. They discussed some of the efforts that are underway to pinpoint the types of cells that harbor the viral reservoir and to measure the amount of reservoir virus that is capable of replicating. “We’re looking for some sort of magic bullet … that tells us if and when the virus will return if we stop antiretroviral therapy,” said Pillai. The final panel served as a debate over the relative merits of cure, i.e., total eradication of the virus, versus post-treatment control. “What we’ve learned from asking a lot of people living with HIV how they feel about cure itself … is that people want eradication,” said social researcher Dr. Judith Auerbach, a professor in the Department of Medicine at UCSF and former director of public policy at amfAR.